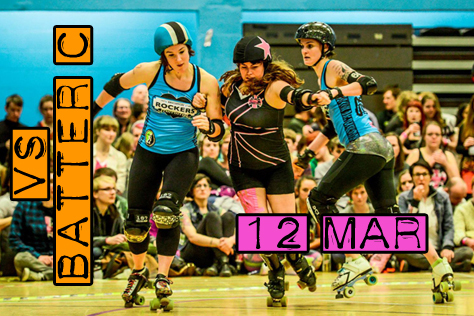 This Saturday 25th March (ie tomorrow) sees the final instalment in what has become an almost three years long best of three series between south coast roller derby titans Brighton and Portsmouth. The action takes place at Havant Leisure Centre from 3.25pm (doors at 3) with the epic A-team decider up first, followed by a first ever open door meeting between the two leagues’ B-teams. Tickets are £7 (including booking fee) from the link at the bottom of this piece. Online sales close at midnight or you can pay £8 on the door tomorrow. Havant is on the Brighton side of Portsmouth, so it’s a short trip of around an hour by road or rail. Car users should point their Sat Navs at PO9 2AY, whilst direct trains from Brighton are at 12 and 42 past the hour. A day return to Havant costs less than £9 with a railcard. Please note that the after party is at the Wave Maiden craft beer bar in Osborne Road, Southsea, around 20 minutes walk from Portsmouth & Southsea station. Anyone travelling by train who is thinking of hitting the after party would be well advised to spend an extra quid or so to get their ticket to Portsmouth & Southsea rather than Havant (breaking your journey is allowed). Havant Leisure Centre (NB Google may try to trick you into going to the Horizon Leisure Centre in Waterlooville instead) is around seven minutes walk north of Havant station, set amidst various civic buildings as the name Civic Centre Road might suggest. Pubs in the area are generally a bit rough and ready – the best is probably the Parchment Makers (Wetherspoons) five minutes walk south west from the station, nine from the venue. 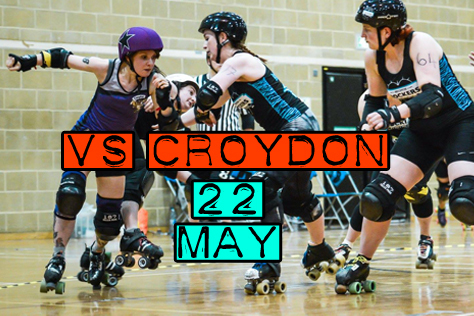 Although it’s an away game this is actually the second closest roller derby venue to Brighton (after Haywards Heath), so we hope as many Rockers fans as possible can travel across for tomorrow’s games. [Skip the next two paragraphs if you don’t like reading predictions before a game.] Portsmouth’s A-team currently place 22nd in the UKRDA on 597.3 points, with the Rockers a smidgeon behind in 24th (595.0). The prediction machine at flattrackstats.com gives the Wenches 57% chance of victory here, with an expected differential of 32:29 working out at something like a 192-174 home win. FTS also offers a prediction based on the Euro rankings, but given how spangled Brighton’s placing is after recent games against continental sides we don’t dare press the button for that! We have to use Euro rankings for the B-team game though, and these suggest the Rockerbillies are in for a challenge. Portsmouth’s B-team place 157th on 516.1 points, with the Brighton Bs 362nd on 436.4. The hosts are given a 93% chance of victory here, with an expected differential of 55:23 working out at something like a 275-115 win for Pompey B. It’s worth noting that these B-team rankings are based on a small number of games – the home side’s last ranked match was around a year ago – so they’re probably not that great an indicator re tomorrow’s second string game. We don’t just have the FTS computer for guidance when it comes to the A-team match-up. Do past results hold an indication of what to expect? The first public game between the two leagues was exactly two years and five months ago on 25th October 2014 in Havant. The final score then was Portsmouth 159 – Brighton 221. The two sides didn’t have long to wait for a rematch. This was a British Champs game in Haywards Heath on 11th July 2015 which saw the Wenches upset the odds to effectively relegate the Rockers from Tier 2 South. Final score: Brighton 150 – Portsmouth 215. On the off-chance someone reading this doesn’t know of the Portsmouth Roller Wenches, can you give us a quick summary of your history and achievements to date? We are a six year old UKRDA league and came up alongside Brighton as “south coast sisters”. We count our growing comprehensive Fresh Meat program as one of our recent achievements, alongside spreading the word of roller derby in our local area through promotion of the league. We played two seasons in Tier 2 of British Champs but left the format to travel and play more European games. We are ranked in the top 12% of the European table and we’re big in Japan. What are you expecting from Saturday’s A-team game against the Rockers? Care to predict the result? I don’t think past Wench/Rocker results will be any indicator of what’s to come tomorrow. Both teams have evolved and changed so much since they last met. I can predict that both teams will want it and both teams will fight for it. Being an hour apart on the coast the two leagues presumably know each other fairly well. Any particular Brighton players or tactics you’ll be looking out for tomorrow? We don’t have a tendency to give too much thought to individual players, just the big picture. We are familiar with the Rockers’ most recent game play as we were able to watch them play against Vienna earlier this month. Similarly, any particular players or tactics the audience should look out for from the Wenches A-team? Um, I obviously won’t be divulging anything specific tactically, only to say that what we have been working on is looking tight and right. I’m sure the audience will clock the marvellous new talent we have making their A-team home debuts in this game. The day’s second game sees a first ever meeting of the Portsmouth and Brighton B-teams. How are you expecting that one to go? I hope this will be a fun and fulfilling game for both B-teams. Our leagues have a lot of history and these skaters are the future of both the Rockers and Wenches, so I hope they carry on the tradition. Look out for some of our Bs who are also making their Wench home debuts. Finally, for those Rockers fans travelling across to Havant on Saturday, what can we expect from your venue? And from the after party? Care to predict the result of Saturday’s A-team game against the Wenches? We always enjoy playing Portsmouth – they are an amazing team with super strong players – but we’re gunning for the big win. We are working on getting our rankings back this year and this is a good place for us to start. Being south coast neighbours you presumable know the Portsmouth league quite well? Any particular players or tactics of theirs that you’ll be looking out for? We do know each other really well. 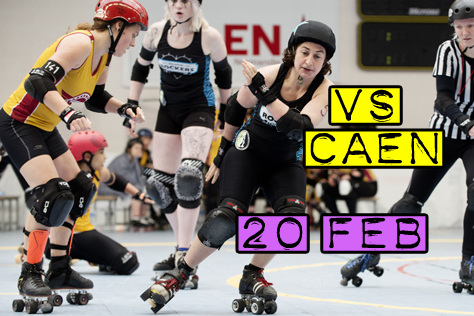 We even trade players occasionally, eg Little Miss Demeanor :o) If they’re playing we’ll be looking out for people like Nina Nunchucks, Dropkick Molly and Valkyrie Pain – she’s a brutal blocker and jammer – but we’ve been practicing taking the big hits so we are ready for them all. Any players or tactics to look out for from the Rockers in the A-team game? We’ve been working really hard on our walls (nothing new there) but recently we’ve taken to being really flexible in the way we form them. We’ve always been an adaptive team but that’s really improved recently. Having Finn McCruel join us last year has really upped our blocking and offensive work – so watch out for some super strong walls and some killer offense. Any thoughts on the first ever meeting of the Portsmouth and Brighton B-teams? Our B-team is really strong at the moment. We’ve got some amazing new players coming up through the ranks and our crossovers are a force to be reckoned with. Watch out for Farmergeddon – she’s been teaching us some of Brawling’s tricks of the trade recently. Hopefully as many Rockers fans as possible will make the short trip along the coast on Saturday. Any message for them? We love you. It makes such a difference having our fans cheering us on and our fans are obviously the best – plus they help us smash the after party. Finally, any other games/events (that you can tell us about) on the horizon for the Rockers in 2017? Our next game is away to Norfolk Brawds in April and then we’ve got a few exciting games in the pipeline but nothing confirmed yet. We’ll announce the games when they’re confirmed on our website and Facebook page, so keep an eye out. THERE’S ANOTHER PREVIEW OF TOMORROW’S GAMES (INCLUDING THE VIEWS OF OTHER BRIGHTON AND PORTSMOUTH SKATERS) ON PAGE 14 OF OUR LATEST FANZINE. CLICK HERE FOR THE ONLINE VERSION. BRATS Review Of 2016: PART FOUR – You VOTED, We COUNTED, They WON… the 2016 AWARDS! 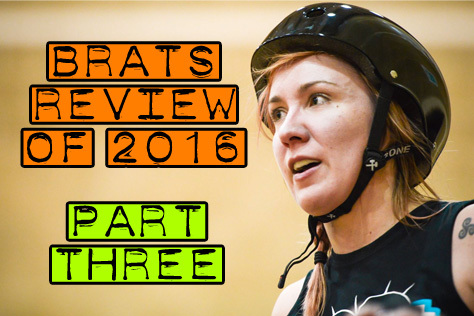 If you’ve missed the previous instalments, we’ve been summarising all the events (eleven A-team, five B-team and three special games) from an action packed 2016 in the world of the Brighton Rockers. Check out our recap of the year at these links: PART ONE (Jan-June) / PART TWO (July-Oct) / PART THREE (Nov-Dec). This fourth and final part of our Annual Review is a little different as we crack open the ballot box from the BRATS/Turn Left end of year award voting. Last year’s box only appeared at one event (and no e-mail votes were cast), whereas this year it was gobbling up voting forms at three different locations – the games v Milan and Eastbourne in Haywards Heath on Dec 3rd, the Rockers exhibition match at Brighton Corn Exchange on Dec 10th, and that evening’s Christmas after party – as well as a flurry of votes by e-mail. This one’s for all those folks whose roles aren’t covered by the other award categories, ie everybody except the players, refs and NSOs. A dozen different names picked up votes here, including some surprising choices – we’re not sure exactly what impact wrestler Stone Cold Steve Austin had on the Rockers’ year. Our voting form mentioned bench crew, photographers and announcers as the sort of people this category covers, and this year saw a three-way race between one of each for the gong. Tied in second place were bench coach extraordinaire Mistress and top snapper John Hesse, whilst mic wielding loudmouth (ie awesomes announcer) Tenacious P took the prize by just half a vote! And if you’re wondering how we got a half-vote, someone put “the announcers” so we split that point between Phil and co-host Charlie. Seven names picked up nods in this award for referees and NSOs. Curiously, last year’s winner Noise Tank didn’t garner a single vote (in this category at least) this time around – serves him right for moving to Japan, yeah? There was a strong showing from K-Tea, but in the end it was a two-way tussle between NSO (and A-team skater) Hippy Hippy Skate and Rockers Head Ref LaserHammer, with the latter edging ahead by a handful of votes to reclaim his crown from Noise. 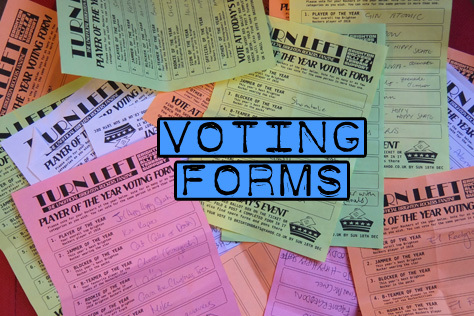 The voting form lists this category as being for “the most inspiring Brighton Rocker on or off track” and fifteen different names were put forward, including players, announcers, bench crew and a ref (you got a vote here Noise!). This award largely favoured people involved in the league’s coaching set-up. Fresh Meat tenderisers Hairy Fairy and Kapow both picked up a load of support, as did last year’s winner Shambolic, but in the end it was the transfer from Finland, Finn McCruel, clinching the prize here by a single vote over Gin Atomic. There were eight skaters put forward for this category, but the result was never in doubt. Farmergeddon’s rise through the Rockers ranks has been meteoric. Having only taken up the sport as part of the 2016 Fresh Meat intake, ‘geddon will be in the A-team squad the league send to a tournament in Normandy later this month. Fellen E Assault takes second place in this category, but with over 70% of the total votes cast, Farmergeddon rolls out the most convincing victor across the entire 2016 Awards… and will be looking to follow last year’s winner in becoming an established A-team AllStar. The electorate selected a dozen names in this Best Rockerbillies Player category, with almost all of those picking up multiple votes. There were strong showings from Lab Wrath, Polly Dartin’, Fellen E Assault and Chloe Colossus, amongst others. Rookie award winner Farmergeddon finished second here, but Cruelty Spree took the win by a comfortable margin. Ten names picked up nods in the poll for Brighton’s best defensive player of the year. Hairy Fairy took the win by a handful over Finn McCruel, becoming the first player to retain their 2015 award. Cake Or Death and Irish Mist were amongst those picking up sizable voting tallies here, but the result was never really in doubt. Despite being one of the main awards, this category actually saw the fewest different players voted for in the entire ballot, with just six names written in for this jamming prize and some very surprising omissions. Dr Whooligan, Mighty Mouse, Gin Atomic and Emma The Condemner picked up a few votes, but in the end around 75% of the ballot cast was split between just two people. 2014 winner Kapow has to settle for the runners-up slot here, with Shambolic taking a narrow (three votes) win. Moving to Japan may have reduced Noise Tank to just one vote in the entire ballot, but it doesn’t seem to have done Gin Atomic any harm. Gin joins Hairy Fairy as the only person to retain their 2015 award. It was a fairly close run thing in what (with sixteen names in the running) was the most heavily contested category of all. Cake Or Death, Finn McCruel and B-teamer Cruelty Spree picked up a fair few votes here, but in the end it was former housemate Shambolic who Gin edged out by a couple of votes to triumph. 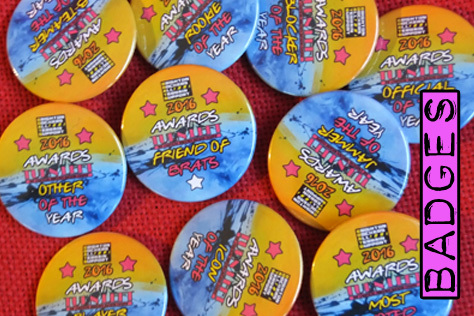 That rounds up the eight categories on the voting form, but (as happened last year) the fact that the company who make our winners’ badges have a minimum order of ten means we’ve rustled up a couple of bonus gongs. The first is our MOST VOTED FOR award, which goes to the person who picked up the most votes across all of the categories without actually winning any of them. Lab Wrath took this one last year, but here it’s a three-way race, with the bronze going to Cake Or Death, silver to Hippy Hippy Skate and the WINNER – KAPOW taking the gold. Where gold means a tacky badge and certificate. Finally we have our new FRIEND OF BRATS award. Although it says 2016 on the badge and certificate, this is more a Hall Of Fame type thing for someone who has really helped BRATS out over the years. There are loads of potential names in the frame here – heck, our website and fanzine have featured interviews with well over a hundred skaters (from the Rockers and elsewhere) so far, on top of all the awesome advertisers and photographers who have contributed. Special shout outs to the amazeballs John Hesse – recently voted best photographer in a national derby poll – and our ever reliable if confused advertiser Mr Séamus (yes, he really does pay us full price for his fanzine ads, even after moving to Devon). In the end this inaugural award has to go to the person who appeared on the cover of the very first Turn Left, providing us with inordinate help re interview wrangling etc over the years, most recently sourcing tributes to Gin for Issue 17 and being the main interview in Issue 18. We’re referring of course to the well deserved WINNER – MISTRESS. BRATS Review Of 2016: PART THREE – The Road From ROCKCITY To The CENTRE of BRIGHTON! 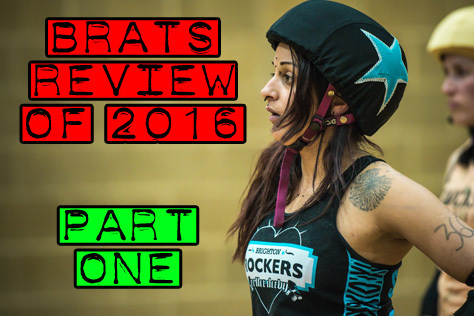 If you haven’t caught the previous instalments in our Review of the mighty Brighton Rockers in 2016, check out PART ONE (Jan-June) here and PART TWO (July-Oct) here. This third episode covers the absolute frenzy of events – virtually one every weekend – that marked the end of the year in Rockersland… Early NOVEMBER and it’s another double header in Haywards Heath for the hard-working Rockers. The A-team AllStars face Eindhoven’s Rockcity Rollers in a rematch, the Dutch side having beaten Brighton 167-140 in the playoffs of February’s Slip It tournament in Normandy. The visitors get off to a flying start, with jammers Dolly Deathstar and Marcie B helping to put them 22-0 up after four jams. Gin Atomic gets Brighton on the scoreboard in the fifth, but it’s not until a feisty 15-point power jam from Shambolic halfway through the period that the Rockers start closing the gap. Rockcity calling a team timeout when 46-36 up. The visitors have a small but very loud travelling support here, who cheer them on to a strong finish to the half (90-45) with Sham the only Brighton jammer to have really got the better of the Dutch defence. The second half starts out the same as the first with Rockcity taking a couple of dozen points without reply, before Gin steps up to the plate. Brighton pack keeping Cat Galore back well as Gin puts almost 30 on the board. Cut track call on Dolly sees Kapow close the gap a bit more. The visitors only have eleven players here. Side effects of a small roster include not just increased tiredness in the later stages of the game, but also an increased risk of fouling out. Sure enough, Rockcity lose a player to the seven penalties rule. The slight disruption to their line-ups caused sees the Rockers clawing it back to 131-159. It’s a question of Brighton’s persistence v Eindhoven’s stamina now. Cake Or Death and Finn McCruel super tough in the black packs, Gogozilla and The Brickster likewise in the purple. The visitors have enough Dutch courage to keep their wheels in front and roll out 185-151 victors. The Rockcity match is Gin Atomic’s last before being exiled to Japan, whilst today’s B-team game is a final Rockers showing for Lab Wrath who is moving to another league. The Rockerbillies’ opponents are a mixture of Southampton City Rollers and Basingstoke Bullets, with the two Hampshire teams having recently decided to join forces for scrims and games. We’ll call them Basinghampton and they prove sterling opposition for the Rockers Bs. It’s one of the closest games we’ve seen with the scoreline bouncing around the level (67-67, 84-85, 89-89) before some great jamming from Slap Dash edges Brighton into a 101-97 half time lead. The likes of Toil N Trouble, Evil Kin Evil and Billy Horroday throwing down hard in the white packs, with Noonz, Dolores Diablo and others hitting back for Brighton. BRATS couldn’t make it to this next event, so Emma The Condemner has kindly supplied us with a report: “Avast! Mutiny On The Bouty! 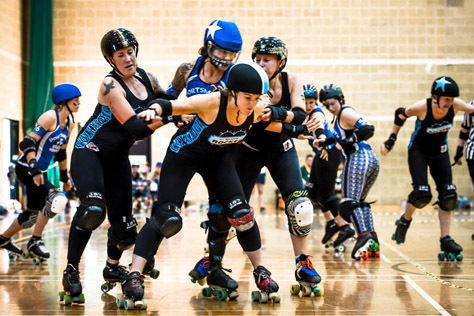 A derby sevens tournament hosted by Portsmouth Roller Wenches in Andover, Hampshire. True to Rockers style, our septet arrive slightly panicked (due to tremendous traffic diversions) without much of a clue of the format. It turns out there are two separate four team knockout tournaments – independent and advanced – with the Rockers seven taking part in the latter. With six games today in total, each will consist of just one 30-minute period. We get to watch two former Rockers, Bionic Betty and Feisty McGee, up against each other in the opening intermediate match, before we take to the track against the A-team of hosting PRW. We’ve come up against the Wenches on a fair number of occasions and are relieved at the absence of RIP McMurphy (now playing in the States), although we still have to contend with the likes of Nina Nunchucks, who is as terrifying and brilliant as ever. I can’t remember the score (sorry) but we take the victory. I win MVP and don’t know who else won anything because I’m massively self obsessed… and forgetful. “The other advanced semi-final sees Team Spektacular – who only feature players wearing glasses and have the best team name we’ve ever come across – defeated by the co-ed team Hoodlum Fang Advanced. We’re becoming increasingly nervous at facing a co-ed side for the first time ever. In our favour is the fact that they’ll be coming straight off the back of a hard-hitting game against Spektacular, whereas we’re a little rested but full of lunch. The prospect of playing against a team of massive boys (and two equally scary girls) makes it very obvious to us that we have to go in for the kill from the very first second. It brings out the best in us and we play a really strong game. We know we have to keep the inside line locked down because we saw Hoodlum’s Tenacious P (the lovely announcer at Rockers home games) nip through on numerous occasion in the previous match. Thanks Emma. BRATS pick up this write-up in early DECEMBER as Haywards Heath plays host to another Rockers double header (a mere three weeks since the last one). The A-team AllStars face Milan Harpies in the first game. The crowd is fairly small today, which is to be expected since the SUPER EXCITING THING HAPPENING NEXT WEEK has meant the Rockers cannibalising their own attendance. One factor when hosting teams from overseas is that they’ll often bring a squad of fewer than fourteen – numbers reduced due to issues of travel costs, time off work, etc – especially now that Brighton are WFTDA apprentices and players must presumably come from each team’s official international roster? Rockcity had it tough (despite their victory) last month when they arrived with eleven skaters, but Milan are here with… NINE! This could get messy. The Rockers get off to a flying start and are 76-35 up halfway through the half, as the referees tell announcer Tenacious P to be a bit quieter (the skaters can’t hear the penalty calls). Kapow v the visitors’ most effective jammer Electric Lemon next. Milan are getting plenty of lead jammer statutes here, but they’re almost always picking up a track cut straight after. Early in the second period, with Brighton 130-62 up, those penalties are making their mark. The Harpies are down to seven players now, with two fouled out and sat in the crowd. They’re not going down without a fight though, and battle their way back to 149-108 with some great jamming from Martattack. Electric is next to foul out for the Italians with Martattack following soon after. Not only have Milan lost their two biggest jamming threats but they now have only FIVE players left. The remaining Harpies must play out every jam – and the cleanest games of their lives – for the ten minutes left of this match. It’s a fantastically resilient performance from them, slightly aided by a little touchline advice from the foulees, which head ref LaserHammer tells them off for. Somehow the Fantastic Five match the Rockers point for point in the final jams, with a great apex jumping call off from Baby Razor closing out the game. Brighton take a surprisingly narrow 195-159 victory. Great work from the five Harpies. The day’s second game sees the Rockerbillies facing Eastbourne Roller Derby’s brand spanking new women’s B-team, the Cherry Bombs. Scorewise this is similar to the ‘billies outing against Basinghampton, with lead changes aplenty in a first half that ends with the Brighton team 91-90 in front. Crikey! Mistress is bench coaching both the A- and B-teams for the Rockers today. Eastbourne’s CalEmity fouls out early in the second period, with Obliviator (the ‘billies most dangerous jammer today) racking up a number of 10-0 jams. InnsterSlam and Elle Hound are amongst the Bombs starheads keeping things close here. Great jamming from the unyielding Chloe Colossus – back from a litany of shoulder injuries – sees Brighton establishing a 25-point lead as another Cherry (Newmatic Drill) is plucked from the penalty seats to the crowd for a foul out. 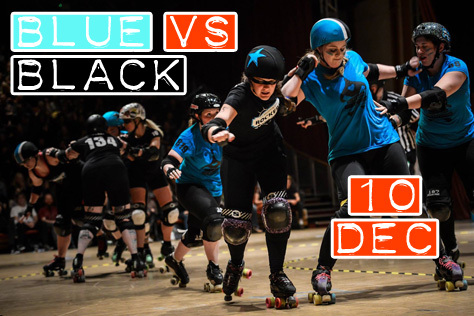 Jumping Jack Smash and T-Wrecks battling hard in the purple packs, Cruelty Spree and Jackie Jerkheart likewise in the Brighton black, as some great jamming from the likes of Yorkshire Brew-ser and Elle Hound sees the visitors claw back the lead and build one of their own. It’s 172-182 to ERD as we start the final jam. Obliviator v Brew-ser. Brighton defence super tough. Two full passes for the home starhead ties things up at 182-182. 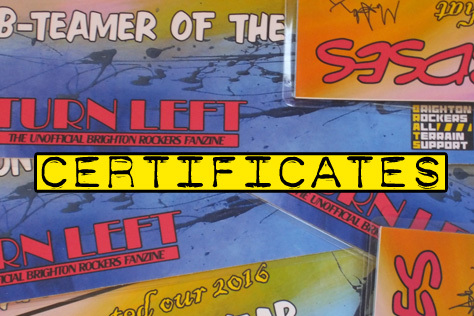 As the seconds tick down is there time for a final Rockerbillies pass? There is as the B-team ‘billies take the win by a tiny margin (186-182) for the second game in a row. Wow! Did you check out Part One of our Review of 2016 last week? Click here if not for the full story of January to June in Rockersland. We pick things up in Part Two (slightly delayed due to a bout of flu in BRATS HQ) in the seaside sunshine… The month of JULY saw one of the longest awaited match-ups in British derby. 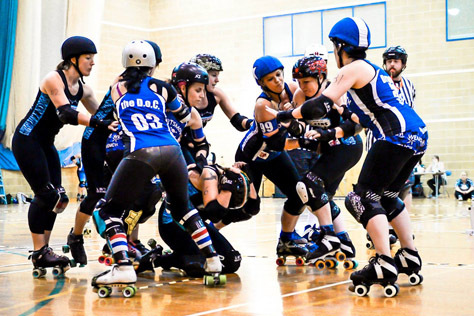 Brighton and Eastbourne have both had roller derby leagues for several years. Although the two have scrimmed with and against each other many times behind closed doors, there has never been a public game between them. 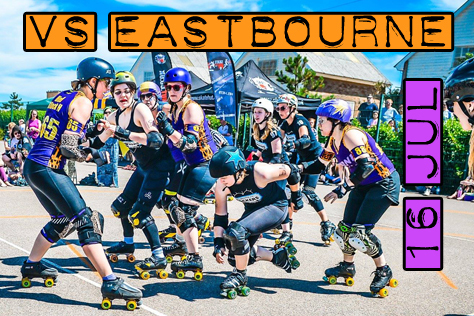 All that changes on the Saturday of Eastbourne Extreme 2016 as the Brighton B-team Rockerbillies face off against Eastbourne Roller Derby’s Bourne Bombshells in the lunchtime sunshine on Ebo seafront. These two sides narrowly missed out on meeting in the playoffs at last year’s Extreme tournament and both are much changed twelve months on. Brighton are giving a few of their 2016 Fresh Meat intake a first taste of action in front of a crowd, whilst Ebo (who are having a quiet year in terms of open door games) also have a number of new skaters in their ranks. The Rockerbillies have the better of the opening exchanges, with the likes of Mighty Mouse, Lab Wrath and Hippy Hippy Skate jamming them into a 35-14 lead. Despite the scoreline, which soon extends to 76-24, the ‘shells are getting as many lead jammer statuses as Brighton here. Track cut penalties are in abundance, however – as they would be on an outdoor surface with no perimeter wire to warn you – and these seem to be hitting the purple jammers harder. Lily Malicious donning the Eastbourne star for the first time today. Hates jamming apparently, but her haul of fourteen marks the hosts’ best jam so far. Scoreless outings for Crash, Von Stackit and Amazing Graze follow as the Rockerbillies take a 122-48 lead into the interval. Polly Dartin and Speedy Gonzalex giving good defence for Brighton in the second half, with Smash’Er Fierce and The Philosofear both as hard-hitting as ever for Bombshells. Cruelty Spree fouling out for the ‘billies now. “You only get seven penalties in roller derby,” intones Tenacious P on the mic. “So make them good ones,” adds Mother Mercy. Smash’Er sending the entire pack (Brighton and Eastbourne) flying now. A number of high scoring jams for the impressive Mighty Mouse have made the difference here, as ‘billies bench coach Mistress celebrates a 207-142 win. The Rockers keep things chill over the summer, with their only public outing on skates in AUGUST being in the Brighton Pride parade. Early SEPTEMBER brings a double header in Haywards Heath against two challenge teams. First up the A-team AllStars face Team No Fuss. Captain Gin Atomic gives the hosts an early lead, before a great turn in the No Fuss star from Beat’her Parker (dancing along the outside line on her toe-stops) puts the visitors 25-16 up as Brighton call a team time out. Kapow is having a really good game today, battling hard to put more points on the board for the Rockers, but the No Fuss defence – particularly Wheel Deal and Liannarchy – are super resilient. Game tied at 40-40. Beat’her off for a while being treated for an injury. LRG’s O’Malley now donning the star every other jam for No Fuss and hitting Brighton hard, but some great starhead outings for Velvet Bottom, Gin and Shambolic round off the half with Brighton 93-50 up. Half time sees a woman angrily berating a group of fans with a ‘Kick Her In The Face’ banner. “That’s not in the spirit of the sport,” she rails. Er, apart from being the Rockers team’s pre-game chant. Beat’her is back in action in the second half. She and Liannarchy are putting in good stints in the No Fuss star, but Brighton are racking up roughly double the visitors’ points haul here. Super tough blocking from Finn McCruel as Kapow hits another nineteen without reply. Further Kapower jams follow. Janey calls a team time out with one second left on the clock. Gin spins in a few more passes in the bonus jam as the AllStars roll out 240-113 winners. Curiously there are no victory laps and slaps, with Bomb S’Quadder Chasin’ Status the only member of the crowd to line up by the track tape. Maybe the ethos of ‘No Fuss’ is contagious? Rockerbillies v Team Dragon now, a final game for ‘billies co-captain Van Hayley before her transfer to Bristol Roller Derby. The Rockers B-team are low on numbers here, so five Bourne Bombshells have joined their ranks. Several No Fuss skaters are back on track in Dragon colours. Things start out close, but a little messy. Dragons’ Tinkahell is expelled from the game for entering the penalty box at a dangerous speed. Janarchy, Amazing Graze and Hippy (the ‘billies best jammer so far) edging Brighton into a 30 point lead, but Dragon pull it back to 95-82 at the half time whistle. The Rockerbillies start the second half with their jammer in the box and Streets Of Rage takes advantage to make it a three-point game. Solid jamming from Lab, Hippy and Speedy, together with tough blocking from Van Hayley and Dolores Diablo, sees the hosts take a 142-100 lead with half a half left. Velocity Kendal, Streets and Rumpleteaser battling hard for Dragons, but the only question now is whether Brighton will make 200 before the final whistle. A power jam from Hippy sees them do just that with the final pass of the game: 200-118. The B-team sit out OCTOBER, whilst the A-team AllStars head off on two road trips, beginning with the Rockers’ first meeting with Welsh opposition as they take on the Tiger Bay B-team. We like Cardiff, mostly as it just seems to be one giant pub. The Wetherspoons by our hotel has THIRTY real ales on at £1.99 a pint. With Tiny Rebel, Brewdog and Waen Brewery bars in the same street, we leave this road only twice over the weekend, both times for visits to warehouses in the docklands area. The Doctor Who Experience is Sunday’s destination, whilst Saturday’s is Cardiff Central Youth Club. This is Tiger Bay’s first game in this cavernous venue, but a sudden threat of closure (Brains brewery wants to relocate to the site) means it could also be one of the last, gadnammit. 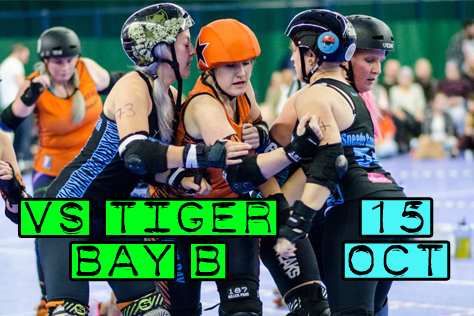 Tiger Bay’s A-team were ranked #1 in the UK Roller Derby Association on several occasions in the past few years, so their B-team is always going to be a tough proposition. The game starts off surprisingly clean, with no penalties (we think) for anyone in the first four jams. No sooner have we written this in our notebook than Cake Or Death becomes the first of a whole sequence of Rockers blockers taking a seat as the hosts rack up a 35-5 lead. Two five point passes for Gin makes things look more presentable for Brighton, but the likes of Hello Reeshi, Boba Fettish and Wild jammerise the hosts into a 102-62 half time advantage. The Rockers have been getting a reasonable number of bites of the lead jammer cherry – with Sham a particularly effective starhead today – but the Welsh packs are super hench. Half time sees a demonstration of junior derby (Tiger Bay are probably the UK’s leading exponents of under-18s derby) as we enjoy the cheapest bar table we’ve ever encountered – £2 for a can of Guinness is practically offie prices! Those blocker penalties we mentioned come home to roost as Hairy Fairy – usually one of Brighton’s cleanest defenders – fouls out in the first jam of the second period. The announcer gets so excited by this that he blows up the PA; the remainder of the game will have a background of just music. Mighty Mouse does well in the Rockers star as the bar table runs out of Guinness and presents us with a Hobson’s Choice of shandy or Carling. The Sussex starheads are not getting much chance to take advantage of LJ status here, with the Welsh jammer almost always immediately at their back. Tiger Bay B-Bombs take it 227-147 and the Rockers retire to the thirty ales Wetherspoons. A mere two weeks (and one day) later and the AllStars are back on the road. This time the destination is Houghton Regis, a cluster of estates outside Luton that takes longer to get to on public transport than Cardiff – waaah! Rebellion Roller Derby are the hosts and they get off to a flying start with Boris and Dew Drop Her hitting Brighton for 17 without reply. The former is Rebellion’s biggest jamming threat, whilst Mayh’Em throws down tough blocking as the likes of Skate Bush and Sham struggle to break through. 48-11. Gin and Juno running master classes in apex jumps for their respective sides. Hench hitting Bush so hard she goes back in time. Never known a half with this many official time outs. It’s a squeaky close 145-122 to the hosts at the break. Rebellion’s bar is even cheaper than Tiger Bay’s. In that it’s free. In that there isn’t one. “A venue with no alcohol means a quiet crowd,” one Rocker solemnly predicted, but the atmosphere’s actually pretty good. Superstar performance in the star from Sham at the start of the second and suddenly it’s 151-141. Rebellion keeping ahead through the period but only by a power jam’s distance (fifteen-ish). Brighton 217-235 down with 1’15” left as Gin lines up against Boris (who is starclad every other jam now) for the umpteenth time. Apex jump. Track cut. Track cut. Apex jump. Track cut. Super tough Brighton pack. Suddenly it’s 235-226. Is there time for two passes from Gin before the jam clock ticks out? There is. Takes it 236-235 in the final second as the Rockers go wild…. 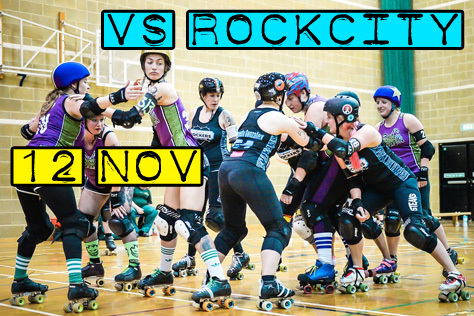 BEDS TIME: The mighty BRIGHTON ROCKERS aim to quash REBELLION this weekend! 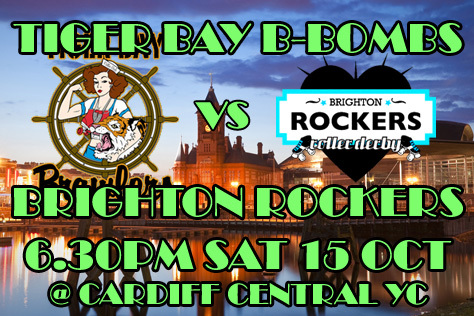 A mere two weeks after taking on the Tiger Bay B-team in Cardiff, the mighty Brighton Rockers AllStars are back on the road. This Sunday (30th October) sees a slightly shorter trip up country to take on Rebellion Roller Derby. 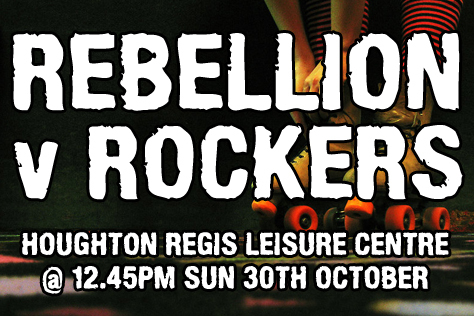 The venue is Houghton Regis Leisure Centre, with the Rockers game kicking off at 12.45, followed by a match between Rebellion B-team Rebel Uprising and the Kent based Apex Predators. Tickets are priced £8.04 (including fees) online – see the link at the bottom of this piece – or £10 on the door. Under 16s go free. The Kings Arms in Houghton Regis is hosting the after party. “Where in the sam heck is Houghton Regis?” some of you may be asking. It’s just off the M1 north west of Luton. This ought to make for a fairly painless direct Thameslink journey from Brighton, but the Gods of Engineering Work will put you on a bus between the coast and Three Bridges. The nearest station to the leisure centre (Leagrave) is a good 2.5 mile hike, so we suggest getting off at Luton and hopping on either an A or Z bus. It’s actually the same circular bus route, with the letter changing en route. Since Houghton Regis/Parkside is the halfway point (20-25 mins) either bus will do. Car users should point their Sat Nav at LU5 5PY. Are you one of those people who don’t like reading predictions ahead of a game? Then skip the rest of this paragraph. Rebellion are one of the earliest formed UK derby leagues, predating the Rockers by some margin. They currently rank 47th in the UKRDA on 510.3 points, with the Rockers placing 23rd (595.0). The prediction machine at Flattrackstats gives Brighton a 91% chance of victory, with an expected differential of 13:6 equating to something like a 195-90 away win. Switching to the European rankings system (likely more accurate as it’s based on a much higher number of games) sees Brighton ranked 73rd (582.0) against Rebellion’s 95th (553.3). Brighton’s chances of victory drop to 66% with a predicted 21:17 differential equating to a much narrower 189-153 Rockers win. Since Rebellion’s B-team hasn’t yet played a ranking game, the FTS computer won’t predict anything about their contest v Apex Predators. Soz. Hi there. For any Brighton fans reading this who might not know of Rebellion Roller Derby, can you tell us a bit about your league? Despite being collectively very creepy we love hugs, especially during training. We have a small cupboard at our training venue where we keep our line up manager Gav and bench coach Blitz hostage. Shhhhh! 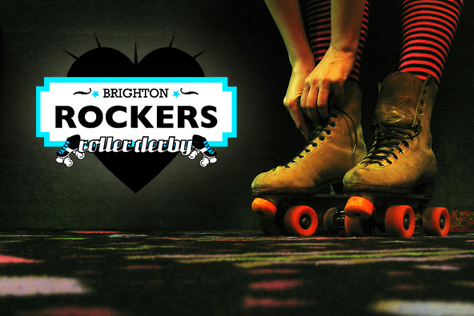 Do you know much about the Brighton Rockers? Any particular players or tactics of theirs you’ll be looking out for at Sunday’s game? We know the amazing Gin, who is very much a double threat not to be taken likely. We have heard they also like hugs, so we are hoping to take advantage of this and trick their walls into letting our jammer escape. Hahaha. Any particular Rebellion players or tactics that the crowd should watch out for? Rebellion is well stocked full of jammer and blocker talent. Best to watch everyone at the same time somehow? Rankings wise, Brighton place a little bit higher than you at present. What sort of a game are you expecting? The day’s other game sees your B-team Rebel Uprising take on the Apex Predators. What should people expect from that match? I believe this is only the Apex Predators’ second open door game, so they remain very much an unknown entity. This is Rebel Uprising’s first game, so to the outside world they are very much another unknown entity. Expect the team with the most together walls to take this one. Finally, what facilities are there at your venue? Anything else to see or do in the Houghton Regis area? There will be food laid on by us at the venue; hot dogs, vegan chilli, crisps, tea, coffee. There’s nothing else other than vending machines at the leisure centre. No bar. There isn’t much in Houghton Regis – a couple of bars and supermarkets. It’s a very small area, but it’ll do! Two away games within a fortnight is something of a rarity for the Rockers. How was the Cardiff trip and have you all recovered sufficiently to face Rebellion? I can’t speak for what it was like on the party bus or in the hostel (I came up to Cardiff a day early and stayed elsewhere) but I understand the Rockers continued their tradition of winning the after party in great style. As for the game itself, we had a great time and the Tiger Bay B-Bombs were such a lovely team. Fortunately I think the hangovers and assorted bruises have faded enough for us to give Rebellion a good game! 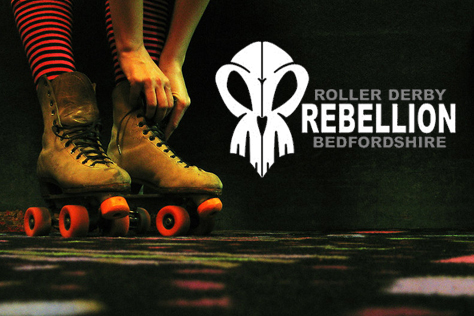 What do you know about Rebellion Roller Derby? Any particular RRD players or tactics you’ll be looking out for? What sort of a Rockers squad can we expect for this game? Will there be many changes from the side that travelled to Wales two weeks ago? The Rockers roster has a similar core to what we had for Tiger Bay B. Mighty Mouse won’t be with us, which is a shame because she was on fire at Tiger Bay (winning Best Jammer in her first ever A-team game!). We’ll have Emma the Condemner and Racey back, so it will look a little bit more like a ‘classic’ Rockers A-team. As for who to look out for, I never get tired of watching Gin Atomic leap across the track, but I also think Finn McCruel is making a huge mark on the Rockers – she’s a badass, incredibly strong and with an amazing derby brain. The Rockers are currently ranked a bit higher than Rebellion. What type of game are you expecting? Care to predict the result? I’d love to win it and I think the Rockers are playing pretty strong, but I try not to predict things ahead of the day. I think I’m one of the less competitive players on the A-team. I’m still so thrilled whenever I’m rostered for an AllStars game that I count it as a win if I don’t fall over my own feet! Mostly I go in hoping for game that forces both teams to bring their best – I want to play some great derby and have a good time. Finally, the Rockers are back in action at Haywards Heath very soon, with the A-team facing two continental teams in quick succession. Rockcity of Eindhoven (Holland) on Nov 12th and the Harpies of Milan (Italy) on Dec 3rd. Have you started thinking about those games yet? It’s exciting and a little overwhelming to have so many games in rapid succession. I have to admit I haven’t had a chance to think too much about the Milano Harpies – I can’t think more than two games ahead! But we’re definitely thinking ahead to the game against Rockcity. We had a great time playing against them at the Slip It tournament in Caen earlier in the year, so we’re looking forward to seeing them again! The B-team is also playing on the 12th, taking on a combined Southampton Roller Derby and Basingstoke Bullets squad with a lot of our fantastic new rookies playing for the first time ever in front of a crowd. 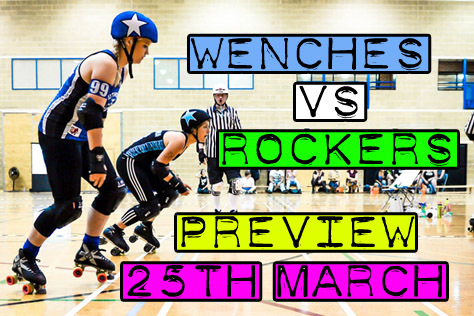 I think fans of the league will be pleased to see our awesome new B-team skaters, and fans of roller derby in general will get to watch a hard-hitting game with Rockcity. I predict a great atmosphere, because I know the team always has the most fun when playing against lovely people.